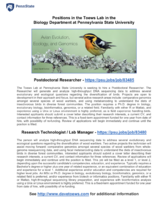 The Toews Lab at Pennsylvania State University is seeking to hire a Postdoctoral Researcher. The Researcher will generate and analyze high-throughput DNA sequencing data to address several evolutionary and ecological questions regarding the diversification of birds. Projects are open to development in their approach and focus, but several active research areas include: comparative genomics amongst several species of wood warblers, and using metabarcoding to understand the diets of insectivorous birds in diverse forest communities. The position requires a Ph.D. degree in biology, evolutionary biology, bioinformatics, genomics, or a related field. Familiarity with either R or Matlab, and experience using a Unix or Linux environment is highly preferred, as is field experience handling birds. Interested applicants should submit a cover letter describing their research interests, a current CV, and contact information for three references. This is a fixed-term appointment funded for one year from date of hire, with possibility of re-funding. Review of applications will begin immediately and continue until the position is filled.